Fueled with new information from Harriet Berkowitz, and by Walter's plan to visit Mt. Hebron cemetery this weekend, I took another dive last night into the New York Times historical database and other sources. The results were outstanding. Not a certainty, but it seems like this is probably the right Henry. Interesting, considering we had an earlier wild goose chase over a Walter Ruby auto accident in the same year in Jersey City. That turned out to be a different Walter, but here is Henry living in the right neighborhood and an accident a few miles from home. I had to pay to download the item for the Times archive, either $3.95 a pop or $15 for 10 downloads. With all my new Rabinowitz information to try, I decided to buy the more economical download pack. One piece of Harriet's new information was the approximate date for Lena's death. That helped me to this eureka moment, an obituary item from the NY Times on January 10, 1924. A few comments: This date does not match any of the Lena Rabinowitzes at Mount Hebron. Also her address is listed at 965 Tiffany St. Four years earlier on the 1920 census she was living at 305 Tiffany St. I may have mentioned this before but I saw again today that the mother of choreographer Jerome Robbins was named Lena Rabinowitz. I guess Robbins was a fairly common name change for various Rabinowitzes. We know that Julius's children Abner and Judith also took that last name. Lena's maiden name was Lincoff, and her brother Bernard Lincoff came to American with Lena and Joseph and lived with the Rabinowitz family for many years. Searching on his name turned up an obituary item for him, as well, dated April 8, 1948. We've known him as Bernard for a long time, but the obit indicates that he was known as Uncle Ben to his nieces and nephews. In Harriet's recent mailing to me, she refers to him as Harry Lincoff. First I thought Harry could have been a son of Bernard/Ben, but in Harriet's photos he looks to be a few years older than Lena's sons Julius and Henry. So I guess he went by all those names. You'll see that the obit does not mention a wife or children. One of the other new names we have to work with is Zimkin. Harriet told us that Sadie married someone named Zimkin and had a child Arthur. 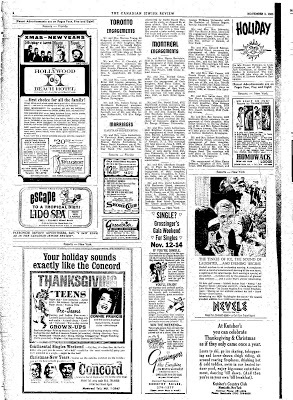 The Times database did not turn out any Zimkin obituaries, but a simple Google search uncovered this page at Genealogybuff.com, which has indexed information from newspaper obituaries. And there is our Sadie, dead at age 47. ZIMKIN Sadie 07,Feb, 1929 DN. Maiden name-Rabinowitz. Spouse-David. Funeral on Feb. 8, in N. Y. City. Finally, I looped back around to the searchable index of New York City death records at Italiangen.org. With our new information, we can now be pretty sure that the following listings are our two great grandparents. Walter points out that the ages don't precisely square with our recorded birthdates for the them, which had been drawn from census records and also from a reconstruction of hypothetical events following from Joseph's Spektor relationship. If our previous narrative is correct, Spektor's son Chaim dies in May 1874 and Joseph goes through religious training, is married and sent off to America, all within about 15 months of Chaim's death. If Lena is 62 at her death in 1924, then she would have been just 13 or so when married and emigrated — seemingly too young. So maybe she is really more like 65. Also, we have Joseph's birth from other records in January 1855, so he would have been 62 at the time of his death. In any case, we will soon have additional information since we have now ordered physical copies of the two death certificates from the New York City Department of Vital Records. They cost $15 and take four to six weeks to arrive. When they do, they should provide a great deal of important information about Joseph and Lena, including their parents' names and birth nation, burial place, cause of death and lots more. Unlike some other names that turn up huge numbers of search results, there are not a lot of Arthur Zimkins. The one we are interested in is the son of Sadie Rabinowitz Zimkin and her husband David. Speaking with Harriet Berkowitz over the weekend, she mentioned that Arthur was married to Frieda and that they may have had a child. Mr. and Mrs. Mac Schwartz, 1357 Van Horne Avenue, announce the engagement-of their daughter, Miss Phyllis Penny Schwartz, to Mark Raymond Zimkin, son of. Mr. and Mrs. Arthur J. Zimkin, of New York. Here is the image (click to enlarge). Look for the Schwartz Zimkin notice in the second column from the right near the top. It isn't necessarily the right one, but the ages are about right and as I say there are not a lot of Arthur Zimkins. This gives us a hopeful lead toward tracking down another living Rabinowitz line. We learned from Harriet that Sadie Rabinowitz's son Arthur Zimkin married a Frieda. We have an intriguing 1965 Canadian engagement announcement for Mark Raymond Zimkin, son of Arthur J. Zimkin of New York. Now from Ancestry, below is a Social Security death index for Frieda Zimkin indicating that she resided and received social security benefits in Canada. Could be that Mark settled with his wife Phyllis in her hometown of Montreal, and that later his mother Frieda came to live with them. Speculation of course. If true, we'd like to find out if Mark and/or Phyllis are living, and whether they had children. 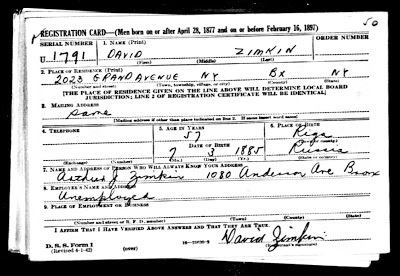 Here is his WWII draft registration. Notice that he lists his only son Arthur J. Zimkin as the "person who will always know your address." Why is this significant? Because it is the first confirmation of Arthur's middle initial, which further links him to that Montreal engagement.